There are a few positive aspects of my life with diabetes… friends I’ve made and the incredible people I’ve met because of T1D would be at the top of the list, but currently, right this very second, I can only answer this by sharing a little more of my on-going JDRF Ride cycling progress. I can cross “NEVER EVER wearing and entire outfit made of Spandex while walking through, and waiting in Penn Station” off my list of things I would never ever do. Yep, nailed that one. 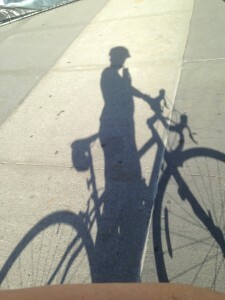 I have also learned you need a Bike Permit to take a bike on the Long Island Rail Road (life is full of surprises). The permit is $5 and doesn’t expire. It looks like a train ticket. I’m sure I’ll never lose that one. Yep. Lost. Long Island is shockingly hilly. An early morning in those hills is far chillier than one would expect. Getting lost is not the fun adventure you would like to believe it will be. Beautiful home, streets lined with potholes, and Oyster Bay way down and in the background. 70% basal rate reduction worked pretty well but I should have started it a bit earlier. I had a GU because the Dexcom arrow was starting to drop, I stayed steady the rest of the ride. Woot. 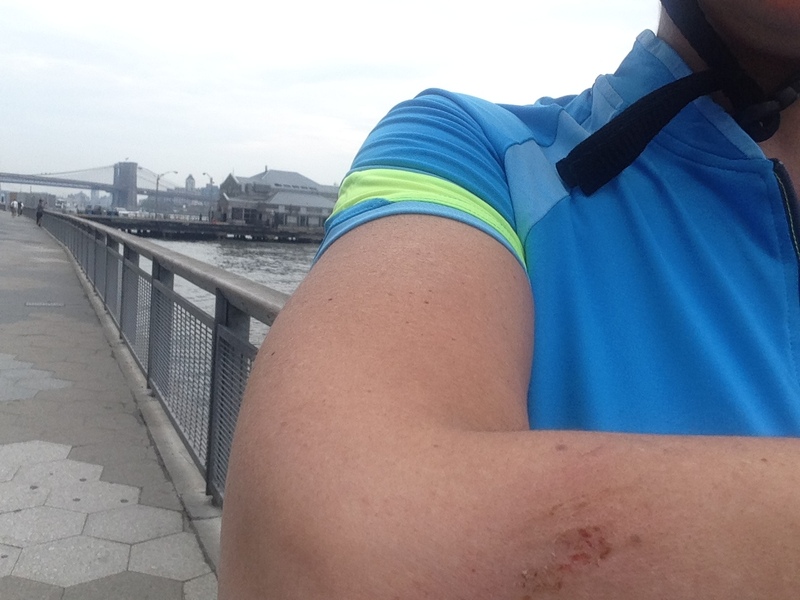 A week later, I learned the following: trying to cross the street during the 5 Boro NYC Ride (when you are NOT in the ride but ARE on your bike) is damn near impossible. Next, I learned that repeatedly bouncing off the railing of the “OMG-why-the-heck-is-this-SO-narrow” ramp up to the George Washington Bridge is similar to being a ball in a pinball machine. It is quickly becoming my signature move. Watch out people. No really, watch-out. Are you ready for the big part? 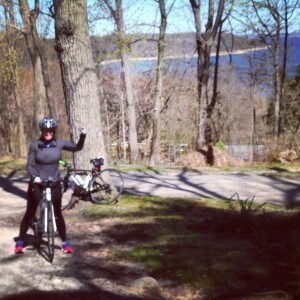 ?… I rode 60 miles in one ride!! Holy smokes! The hills were challenging, I went through a LOT of water, and my bgs ran a smidge high until about the 30 mile mark, but I rode 60 MILES. Nyack, New York is so beautiful. Just amazing. If someone told me that someday I would ride a bike from the lower half of Manhattan, up and over the George Washington Bridge, up through New Jersey, back over the New York state line, under the Tapanzee Bridge and up to Nyack, New York, I would have laughed so hard I would have peed my pants. I might be the slowest and the sweatiest, but I did it. I still need to improve my pacing (it is currently not so hot) and keep increasing my endurance (also still weak). And in even stranger news, I happened to have a meeting right over the Tapanzee Bridge 4 days later and pointed out where I had been on my ride. They asked where I started. 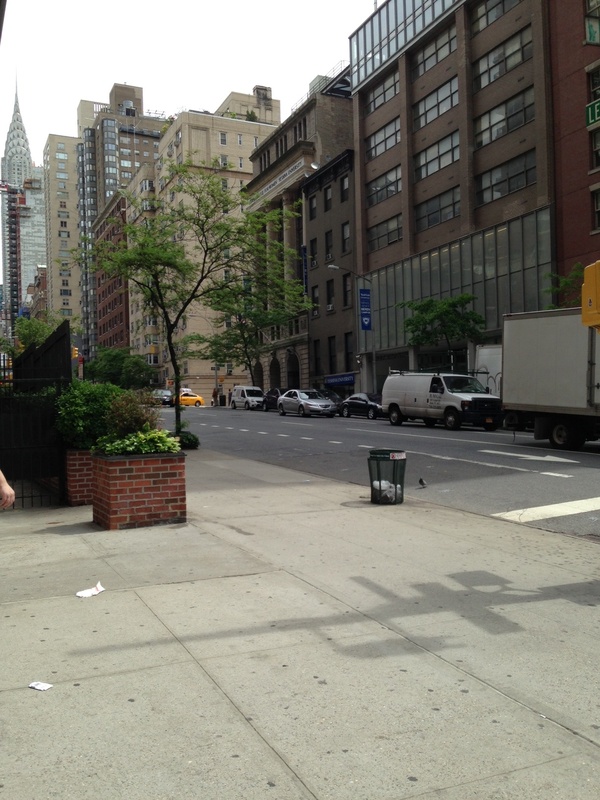 When I answered with, “My apartment”, no one could believe it (I include myself in “no one”). It was SO far away!!! And here’s the deal. I have thought about doing a JDRF Ride in the past. After almost 2 years of the back and forth of getting into one of the Artificial Pancreas clinical trials, I publicly stated (at a conference) that I would do the Ride if I got into the trial. I received the email that I was officially a candidate while still at the conference. 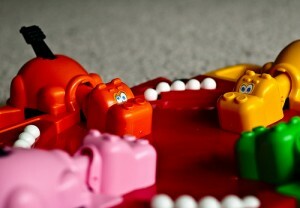 I was/am a chatterbox. I told everyone about being on the candidate list. There was no way I was getting out of this Ride! So here I am 2 and a half months from a 100 mile ride in Vermont (OMG x1000). I think of the many T1D athletes who I admire. My childhood hero, NHL great Bobby Clarke, Olympic swimmer Gary Hall, Jr, and professional snowboarder Sean Busby. I admire them in a way I simply couldn’t imagine before now (and believe me, I already admired them tremendously). 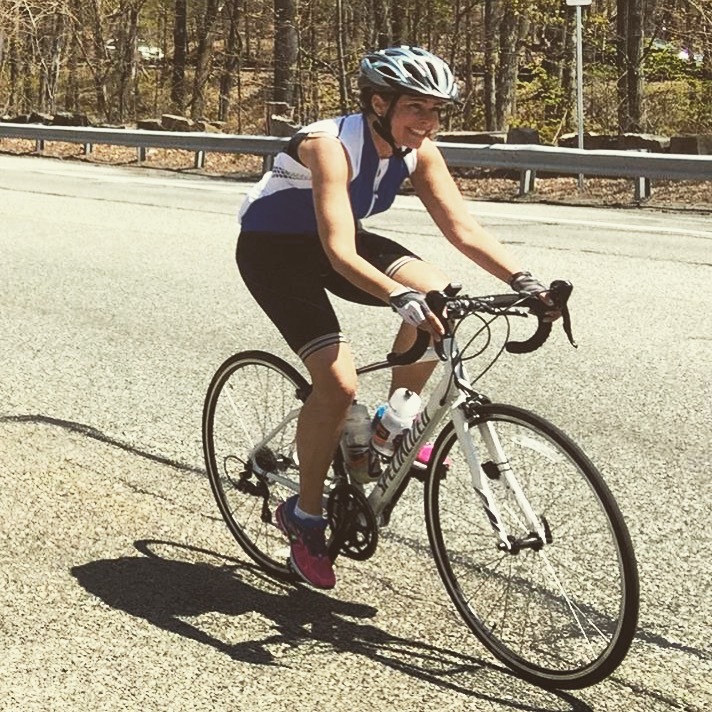 I never thought someone with T1D couldn’t do a ridiculous amount of cycling, BUT I certainly didn’t think that I would ever be inspired enough to try (you read the part about all the Spandex right?). And now, I am inspired… and I continue to try. Tried to stop Fred Flinstone style but with my elbow instead of feet. I’m Feisty and it’s Friday. I have thought quite a bit this question throughout the week. In my mind, I have answered this many different ways but always come to the same conclusion, no, I would not switch T1D with another chronic disease and I’m annoyed with myself for thinking about this as much as I have. In the past 5 years of my life, among my close friends, I have witnessed the following: a friend diagnosed, fight and BEAT the shirt out of breast cancer; a beloved friend diagnosed with cancer and three weeks later watching him take his last breath on this earth; a friend diagnosed with MS; a friend’s constant battle with debilitating depression; a friend responding VERY favorably to a Lupus treatment. In a phrase that was often part of my Catholic upbringing, “We all have our own cross to bear”. I believe this is true, so no, I’m not entertaining the idea of switching. The EXACT spot I thought of SurfaceFine is across the street past the double parked van. Please notice my favorite building in the top left corner. It’s been a year since I started Surfacefine. Rarely does anyone question the name (you know, the 6 people who read it). The name came from a moment when I was considering participating in Diabetes Blog Week (again, way to go Karen). I woke up early to go to the gym. I had an appointment to workout with a trainer so there was not an option to cancel. My bg was in the high 200’s when I woke up. For all intensive purposes we’ll just say it was 300. I had an hour before I had to leave for my appointment. Correction bolus taken plus a little additional rage bolus for good measure. No ketones. I practically drowned in my attempts to hydrate and flush my system. As I walked to the gym, I checked my Dexcom at every intersection. The arrow continued to angle downward. I know it’s counteractive to workout that far out of range. I also know I had to pay that trainer if I canceled. I saw my neighbor on a street corner. She made a comment about my going to the gym and “good for you”. As I race walked my way along, I couldn’t help but think of my attire. There I was in my new sneakers, dressed in spandex, moisture-wicking gym clothes, hair in a messy ponytail looking the part of the committed health nut. No one who saw me knew there was a bedazzled Dexcom sensor in my arm under my jacket, a Dexcom receiver vibrating that my blood glucose level was too high in my pocket, an insulin pump connected to my abdomen with it’s clip pulling down my pants, that I was thinking how I had put a temporary basal rate reduction into my pump soon because the exercise would drop me too much. If I canceled, the outside world would never know it wasn’t because I was a lazy bum who over slept, the world would never “see” that my bg was too high that morning. A morning smile to people I met or recognized on the street. Rosy cheeks from the uphill hike through my neighborhood. A heart pumping sugary blood through my veins while my organs worked double duty trying to flush it out my system while my body absorbed the extra jolt of insulin pouring through me. Yes, on the surface, I’m fine. I am writing these #DBlogWeek entries out of order (shocking, I know) and managed to completely miss yesterday (Tuesday’s) post. I’ll get to it. 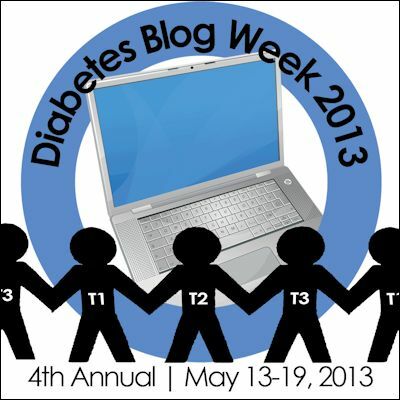 If you’re interested in learning more about Diabetes Blog Week, go here. If you are interested on reading other diabetes blogger’s entries on the topic below, check THIS OUT (believe me, this will introduce you to some really great people in the #DOC and keep you very busy). I’ve been mulling this question over for days. I tend to be a look-at-the-bright-side-of-life thinker. I thought about some of my BIG diabetes moments and how I simply don’t remember them and what a good thing THAT is. Like when I was a little girl and had a severe hypo (unconscious and seizing) in my parent’s bathroom. Glucagon given, the ambulance didn’t show up in time, a local police lieutenant friend of my Dad’s arrived and transported me to the hospital, sirens blazing, while I practically cut my Dad’s index finger to the bone. My jaw had locked on my Dad’s finger as he was trying to keep me from choking to death. Nah, that’s not the kind of stuff that defines my life. That’s not my memory anyway. It is a horrific memory for my parents. What about the time in 5th grade when a school assembly was changed? Being on Regular insulin as short acting insulin didn’t encourage schedule flexibility (but at the time, that’s as far as technology had gone). I played the violin (terribly I might add) and orchestra practice was also changed because of the assembly change and well, you can see where this is going. My morning snack was thrown off, I don’t recall lunch, and apparently in one of my classes, I stood up, declared I loved one of my classmates, and dropped to the floor. My teacher tried shoving juice and food down my throat, although I was unconscious. THAT was a bad idea. I don’t remember any of this. I remember the assembly and waking up the next day in the hospital and puking like crazy. To this day, I have no idea who I declared I loved in my 5th grade class. My Dad must have scared the sh-t out of my classmates too because no one ever told me, they never brought up what had happened, and they sent me cards. Nope, this is not my diabetes memory, this is just a sad and scary blur. I want this to be a good memory blog post. A REALLY good memory. My memory is from YESTERDAY. Yep, less than 24 hours ago. I hadn’t planned to mention this until everything was finalized but let’s face it, THIS keeps drowning out all my other diabetes success and failure stories in my own mind. If you know me or have ever read my blog or seen my tweets, you know how diligently I have worked over the years with JDRF. I am incredibly proud of my JDRF Friends and Family Team, Alecia’s Stem Cells. I am amazed by all the places we’ve walked (NYC, Boston, LA). I am in awe of all the people who tirelessly support our team and me. 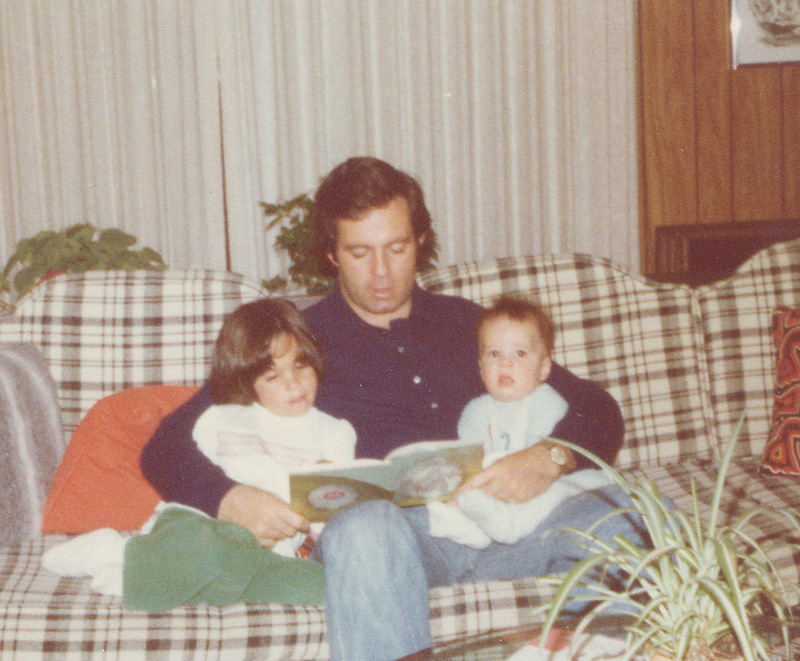 I am grateful to my parent’s for getting involved in JDRF when I was diagnosed in 1979. I was fortunate to attend a JDRF Research Update last month presented by the president of JDRF, Jeffrey Brewer. I loved hearing about where the money is going, the technologies and research. I found it energizing. The timing couldn’t have been better as a month prior, it had been mentioned to me that I was a possible candidate for my local JDRF branch’s BOARD. Say what?! Jeffrey said something that has been swirling around in my head for weeks (well actually he said a lot of somethings like when he spoke about micro occlusions in pump sites that go undetected by the pump which makes PERFECT sense to me). He talked about how the next generation of insulin pumps combined with CGM technologies are available in EVERY OTHER FIRST WORLD COUNTRY BUT OURS (oh yeah, I live in the US). He also spoke a bit about the FDA, lobbyist, and JDRF’s involvement. In my mind, these are the things I want to be involved in. As much as I truly enjoy my roll as a diabetes mentor and spreading diabetes education, I believe there is a next step for me. I want to be part of the change I wish to see in the world. So yesterday I had lunch with the head of the nominating committee at my local JDRF. We had a lot in common and I didn’t hold back my opinions on my local chapter’s direction and off the cuff ideas for increasing involvement and community awareness. I am, by nature, a do-er. I am a planner. I love having goals. I’m also pretty nerdy and creative. This morning I received all the forms I need to fill-out and the invitation to the meeting where my new role as a Board member will be announced in June. I cried when I called my parents yesterday to tell them. There have been a few instances in my life where I truly felt I had a calling to do something. This happens to be one of those moments in my life and it happens to be my diabetes memory.